After all the hype, "Alice in Wonderland" was not as good as I had hoped. However, the 3D and visual effects are stunning, and these help to bolster the movie into one that is at least semi-interesting. Nineteen-year-old Alice (Mia Wasikowska, "Amelia") is in front of hundreds of people at a party when she sees a white rabbit wearing a waistcoat run past. Alice decides to follow the rabbit, which leads her down the "rabbit hole" to a place that she remembers only in her dreams—Underland, but which she refers to as Wonderland. Here Alice meets such people and animals such as Tweedledee and Tweedledum, the Mad Hatter (Johnny Depp), the evil Red Queen (Helena Bonham-Carter), her faithful servant (Crispin Glover, "Hot Tub Time Machine"), the more virtuous White Queen (Anne Hathaway), the Cheshire Cat, and many other crazy characters. The future has been foretold, and it will be Alice's duty to slay the gigantic Jabberwocky. All of the characters remember Alice from when she was in Wonderland as a little girl, but she only recollects her experiences from then as dreams, and therefore must re-learn everything (kind of reminiscent of Robin Williams's character in "Hook," actually). There are a lot of voice cameos in this movie. Alan Rickman ("Love Actually," Snape from the "Harry Potter" series) gives voice to the Blue Caterpillar, who gives Alice advice, and Michael Sheen ("New Moon") voices the White Rabbit, who is constantly running around in a waistcoat with a dangling pocketwatch. The scene stealers in this movie are definitely Depp and Bonham Carter; Bonham Carter is terrific as the vile Red Queen ("Off with his head!" 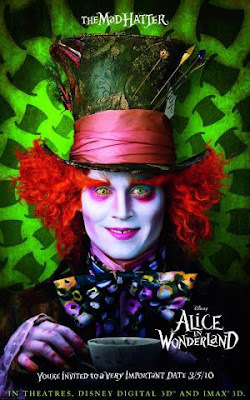 she frequently says) and Depp is great as the Mad Hatter, whom the Red Queen later captures. Hathaway, as the White Queen, doesn't get much screen time, and Wasikowska, as Alice, is fine but not superb. My favorite characters were actually the animated ones—the Cheshire Cat, who of course has a huge smile, the Doormouse, the Bandersnatch, who reminded me of a big dog with gigantic teeth , and Tweedledee and Tweedledum (or "my fat boys," as the Red Queen calls them). I would say Maybe see this movie. If you decide to go, definitely shell out the extra $2.50 or so to see the film in 3D—the scenery is already mesmerizing and the 3D effect enhances it even more. Also be forewarned that even though the movie is rated PG, there are a lot of scary creatures that appear in Wonderland, and children might be scared of them popping off the screen in 3D. The movie combines elements from both of Lewis Carroll's "Alice" stories—"Alice in Wonderland" and "Alice Through The Looking Glass"—so fans of the books might not be big fans of the movie either. I was very excited to see this movie, and although it had a lot of good scenes and characters, it just didn't measure up to my expectations.